EVERYONE CAN APPRECIATE an ideal Christmas. Dinner cooked to perfection, carols sung in harmony, the right presents received by everyone. But what stands out in our memory are the odd moments: the awful gift, the burnt turkey, the silly and authentic images that you’ll never find on anyone’s “Season’s Greetings” card. So take a break from pursuing the perfect Christmas, and enjoy these weird and wonderful gems that got lost at the bottom of the stocking. Members of The Ministry of Fun’s Santa School work out to get ‘chimney-ready’ as they attend a special Santa Boot Camp in Newbury, Berkshire, 2015. Thai nightclub dancers dressed as Santa’s helpers take a smoke break during the night’s celebration in a downtown Bangkok bar on Christmas Eve, 1995. A woman haggles over turkeys sold from a car on the streets of Dublin at Christmas, 1984. 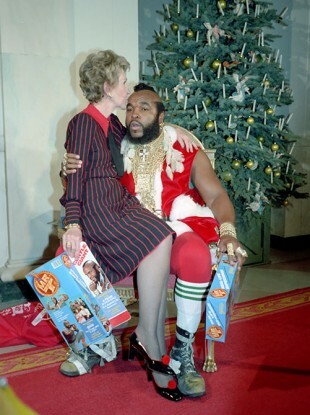 Then First Lady Nancy Reagan kisses Mr T, dressed as Santa Claus, as he presents her with Mr T action figures in the White House, 1983. There’s a fantastic story behind this one. In 1940, at the height of World War II, children at Point Pleasant secondary school in West Virginia denied themselves Christmas presents. Instead, they sent $50 to King George VI, asking for it to be given to British boys and girls, who were enduring the strains of rationing at the time. So George VI asked the mayor of Windsor in Berkshire to pick six children who had been evacuated to the town, and take them shopping and fit them out with clothes or anything else they needed. This photo, taken a month later, shows one of the little evacuees being fitted with boots on the shopping tour, while the mayor of Windsor supervises the purchase and the other children look on. Airplane trails form a perfect star in the sky, just above the Christmas tree on O’Connell Street, Dublin, in 2010. Carol Valentine, 10, gazes longingly at some of the most-wanted Christmas presents of 1964 in New York – a set of Beatles dolls. The Remco figurines now sell online for hundreds of dollars. Farmer Gerry McEvoy, from Sallins, Co Kildare, brandishes one of his prize Christmas turkeys, in 2012. This is an odd one. On 23 December 1972, 16 of this group were rescued from the infamous Andes plane disaster. Stranded for more than two months, they had lost 29 of their friends in the crash, and to starvation and frostbite. Some had famously survived by eating the bodies of their fellow passengers, which were preserved in the snow. Here they are enjoying a Christmas meal with friends and family at a hotel in Chile, two days after their rescue. Some things never change. A little boy gets scared while meeting Father Christmas at a toy shop in Liege, Belgium, in 1944. An American soldier holds him while a woman wipes away his tears. And Santa wonders if it was something he said. Lebanese soldiers travel through Christian East Beirut in a tank, handing out toys and tending to decorations on Christmas Eve, 1989. Too good to leave out. Paul Gascoigne fends off the attentions of a Christmas streaker during Middlesborough’s 2-2 draw with Newcastle Utd, at the Riverside Stadium in December 1998. Dublin shoppers burst through the doors of Switzer’s to take advantage of the sales. Four-year-old Robin Levy, from the Bronx, inspects a few dozen Santas on 48th Street and Eighth Avenue, Manhattan, in 1962. The men in red were graduates of the Volunteers of America charity, and collected donations on the streets of New York that Christmas. At the Clyde Muirshel park in Scotland, druid Chris Turner stares towards the setting winter sun, in celebration of the pagan festival of yule, December 1999. On Christmas Eve 1972, festive lights and decorations hang over the battered streets of Managua, the capital of Nicaragua, the day after a 6.2 magnitude earthquake. The disaster killed around 6,000 people throughout the country, and left a quarter of a million homeless. Mary, Joseph and the wise men appear to worship the Spire, reflected in the window of the nativity scene on O’Connell Street, in 2012. Sidney Smart and her daughters Sandra (4) and Barbara (15), watch from their London home as Queen Elizabeth II delivers her first televised Christmas Day message to the British people, in 1957. An American soldier reads a Christmas card from home as he sits on a bunker in Vietnam, 22 December 1966. Joe Cole, who arrived to Britain from Nigeria in 1949, acts as Santa Claus for the children of Oxford, in 1969. Here he is handing out a present to seven-year-old Nigel Baker outside a shop on Little Clarendon Street. Shoppers camp outside Clerys on O’Connell Street at 1 am on 27 December 2007, waiting for the winter sales to begin that morning. The first 100 people in the door were to be offered a free full Irish breakfast, along with exclusive bargains. Clerys was liquidated and ceased trading this summer, having been a Dublin landmark since the 1920s. Armed with a shotgun and with a dog to help him keep watch, a farmer guards his Christmas turkeys from foxes in Somerset, in 1953. Celia Wall from Donnybrook gets her Christmas cards taken care of at the GPO in Dublin, December 2011. Indian children, dressed in festive outfits, sing their hearts out during a Christmas party at a play school in New Delhi, 23 December 2011. Email “24 weird and wonderful seasonal photos that you won't find on a Christmas card ”. Feedback on “24 weird and wonderful seasonal photos that you won't find on a Christmas card ”.